The Manufacturers Association for Plastics Processors (MAPP) brought nearly 600 manufacturing professionals to Indianapolis Oct. 10 through 12. MAPP held the record-breaking 2018 Benchmarking and Best Practices Conference at the Indianapolis Downtown Marriott in Indianapolis, Indiana. The theme for the year was Be Extraordinary. The lineup of general session speakers included author David Horsager, Alan Hobson and General (ret.) Stanley McChrystal. Keynote speaker David Horsager, MA, CSP, is the CEO of the Trust Edge Leadership Institute, a national bestselling author of The Trust Edge, inventor of the Enterprise Trust Index™ and director of one of the nation’s foremost trust studies: The Trust Outlook™. In addition to three keynote speakers, 82 industry leaders from member companies presented during the new BC LAB sessions, a record number for this event. The BC LABS featured a series of parallel presentation sessions or learning tracks suggested for more than seven functional areas, including owners, human resources/safety and operations/engineering. Each of the 35 BC LABS was designed to equip attendees with indispensable insights, advice and tools to achieve the mission-critical priorities of today and build the successful organizations of tomorrow. Save the date for the 2019 Benchmarking and Best Practices Conference: Oct. 2 through 4, 2019. MAPP honored three member companies with the MAPP 2018 Educational Outreach Awards at the 2018 Benchmarking and Best Practices Conference in Indianapolis. Coinciding with Manufacturing Day, these awards recognize those MAPP member companies that go beyond expectations in their efforts to bridge the skills gap and create excitement about plastics manufacturing among local students and community members. Through strategic partnerships with schools, programs and/or students, these awardees have made significant efforts to increase interest, raise awareness and build skills within the plastics industry. Scholarships awarded in the amounts of $1,500, $750 and $500, respectively, will go to each recipient’s educational institution or program of choice. 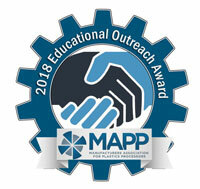 MAPP congratulates the 2018 Educational Outreach Champion Award winners and extends a special thanks to all who participated in this year’s award program. 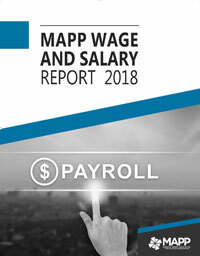 MAPP recently published its 2018 Wage and Salary Report. For the 16th year, this plastics industry-specific report analyzes information on more than 55 job titles common in plastics organizations, including administrative, production, engineering, maintenance, quality, warehouse, sales and managerial job functions. This report also includes information on operational benchmarks, overtime and pay differentials, insurance, vacation and paid time off. The final report is designed to allow senior executives and human resources personnel make smarter, more informed decisions regarding competitive employee compensation. The Wage and Salary Report breaks down compensation information for each job title by both organization size and geographic location. The Operator Training Resource Center, created by MAPP’s Young Professionals Network, is a dynamic asset, designed exclusively for MAPP member companies. Members can utilize this website to explore member resources for operator training programs; browse topics to benchmark a company training plan; build a new operator training framework; or uncover and fill gaps in an existing program. This digital library allows members to browse resources included under each topic or search a specific subject. The site was created by utilizing, curating and organizing resources submitted by MAPP member companies – and continues to grow each week. MAPP is proud to partner with best-in-class industry service providers. Each industry service provider that partners with the association offers MAPP members exclusive opportunities for savings or education. MAPP is pleased to add two new partners: Teel Analytical Lab and Americhem Engineered Compounds. Teel Analytical Laboratories is an ISO/IEC 17025:2005-accredited laboratory specializing in polymer analysis. 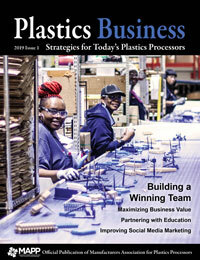 The company works with plastics processors daily and understand their needs and challenges. Laboratory personnel can provide guidance on appropriate testing and help with results interpretation. The certified quality system and validated test methods assure that the results companies receive are accurate and reliable. Whether processors are looking for polymer analysis to make process improvements to a production line or whether they need testing for failure analysis and troubleshooting, Teel’s laboratory can provide the information. Teel Analytical Laboratories is an independent business unit, and all testing requests and results are strictly confidential. Teel now offers 20% off the list price for testing services to MAPP members, not to be combined with other offers. With all color matches, a 25-lb sample with the color chips. 55-lb samples at the 10,000-lb price on any product they produce. The term “skills gap” has been tossed around like candy lately, but the reality of what it means for the manufacturing industry as a whole is scary. Simply put: There aren’t enough skilled employees to do the job. On average, the skills gap costs companies 11% of their earnings, and the problem continues to grow every year. This gap in knowledge prevents companies from growing because they don’t have enough trained employees to accomplish current tasks, let alone build and expand on them. Companies that struggle with this often are filled with stressed, frustrated employees who either quit or significantly lower their quality of work. Or the staff isn’t trained properly early on so they start mashing buttons in hopes that it will fix the problem. In injection molding, this behavior usually leads to lower quality parts, unhappy customers and ultimately a loss of business. You can train your staff members, and then one day they can pass their knowledge on to the next generation. You can hire and train new graduates: If students know they’re guaranteed a position right out of school, it will encourage them to choose a manufacturing career. You can offer the tools needed for less experienced staff members to succeed. You can teach youth about the importance of the manufacturing industry and the exciting careers it offers.